He was a good dog. He had to be to survive his delinqent owners. As gentle as a dove; the only time that I ever heard him growl in twelve years was when another dog bit him in the mouth. 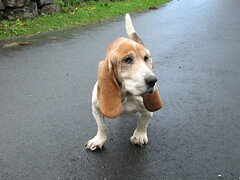 He was a Basset with a hyper streak, not the mellow sedate creature of stereotypes. His tail twirled like a helicopter prop when he was on a track. Stubborn as a mule; he followed his whimsical nose rather than his master's voice. Bowser witnessed the growing up of three boys into men. He shared the family's affection with a succession of three cats. He transitioned as well as any of us in the move to a different house. But it was time to say good-bye to our canine friend. He was going blind and his back hips could not keep up with his eager spirit. We just couldn't justify making him suffer through another cold, wet winter in the potting shed. Today I brought him to the Humane Society for a long nap! Thanks Bowser, you are the only dog that could live out your days in the Bulthuis family. He was going blind? I thought his eyes looked weird in this picture. Sorry for your family's loss Peter. You know, he's probably following some persistent scent up in dog heaven, and still won't come when called.